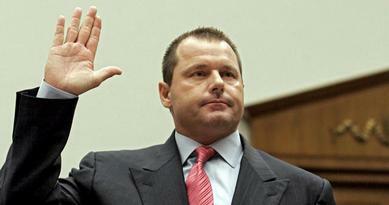 Roger Clemens was named today in a six-count federal indictment charging him with lying about his use of steroids and human growth hormone during 2008 testimony before Congress. A PDF copy of the Clemens indictment can be downloaded here. According to the indictment, filed in U.S. District Court in Washington, D.C., the former Major League Baseball star also lied under oath during a sworn deposition preceding his public testimony. Clemens, 48, was charged with obstruction of Congress, three counts of perjury, and three counts of making false statements. The Clemens charges appear to largely hinge on testimony provided by trainer Brian McNamee, who is identified in the indictment as “Strength Coach #1.” McNamee, in direct contradiction to Clemens’s sworn statements, told a congressional panel about administering performance-enhancing drugs to the athlete. If convicted of the charges, Clemens faces a maximum 30-year prison sentence and a $1.5 million fine, though federal sentencing guidelines would call for a significantly shorter term of custody. Submitted by a rambling rebel on Fri, 2010-08-20 11:21. Why should anyone be charged or indited with anything by a group of liars,thieves and criminals like the congress of the UNited States. I wish he could file suit against them for grand larceny because that is exactly what the greedy corupt bastards deserve for their self exclusion to all programs they pass for the citizens of America as well as their ***in pension plan.